Course Management 101: What Layup Yardage is Your Sweet Spot? What’s your go-to club for approach shots? That question can be bantered around your foursome and the answers would be legion. Some will know precisely what number they prefer. Others will guess a range. The majority likely wouldn’t be sure. PGA Tour pros know this answer immediately. You can as well, but the only way to make this assessment is by using data. Using the massive Arccos database that incorporates more than 100 million shots from nearly two million rounds, we split golfers into handicap brackets and analyzed each group’s proximity to the hole on approach shots from two yardage buckets: 60-80 yards and 100-120 yards. We wanted to find the yardage most people should try to navigate toward when laying up on a par-5 or punching out on a par-4. With Arccos, golfers can automatically track stats on the course and use that information gathered to shoot lower scores. 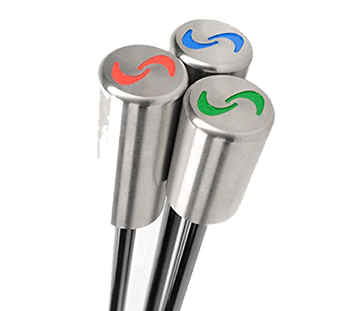 Arccos records on-course performance data via sensors installed in the grips of clubs. The system automatically records and analyzes all of a golfer’s stats, uses Artificial Intelligence to show a personalized strategy for every shot and leverages advanced analytics to inform practice regimens. The results are clear: Every handicap bracket hits it closer from 60-80 yards versus 100-120 yards. (You’re probably saying duh, but stay with us!) The data also reveals a potential performance gap in a habitually forgotten practice area: the half-wedge. The 0-5 handicap has a proximity to the hole of 41.38 feet from 60-80 yards out. Comparatively, the 20+ handicap has a proximity of 62.43 feet from that same range. That 21 feet difference will consistently contribute to more three-putts on a player’s card, giving the illusion that putting is the problem. Data reveals the truth – the higher handicappers need to start working some wedge distance control into their practice routines. From 100-120 yards, the 0-5 handicap bracket performs relatively close to their 60-80 yard averages. There’s only about a 7-foot difference in proximity to the hole from the farther distance. However, moving back in yardage dramatically changes the proximity to the hole for the higher handicap players. The 20+ handicapper averages 83 feet from the hole on wedge shots from 100-120 yards. That’s about 21 feet farther than their distance from 60-80 yards! As a point of reference, PGA Tour players average 19’ 7” from the hole on shots from 100-125 yards. The data suggests that golfers should lay up as close as possible, and the logical extension of that is that they should also dedicate a big portion of practice time to wedge play. Every golfer is unique, but Arccos can help every player know the best strategy for their game. 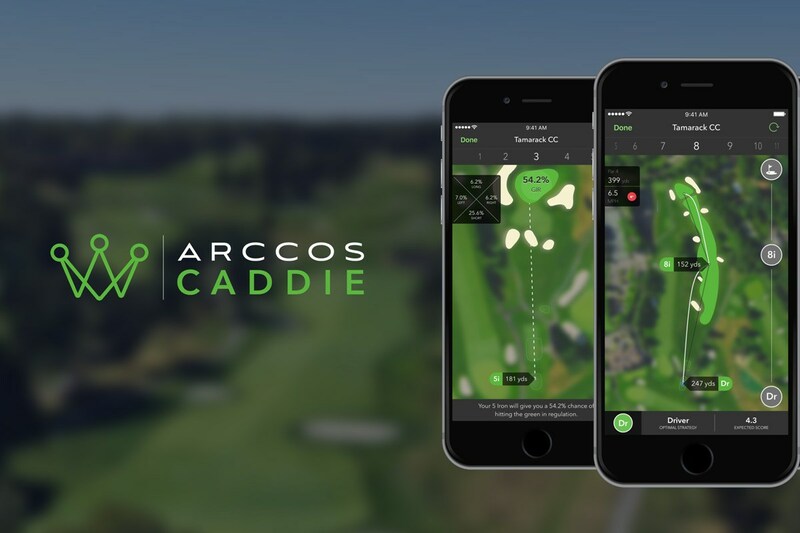 While on the course, tapping the “Caddie” button in the Arccos Caddie app reveals your optimal strategy on any shot from any point on the course. 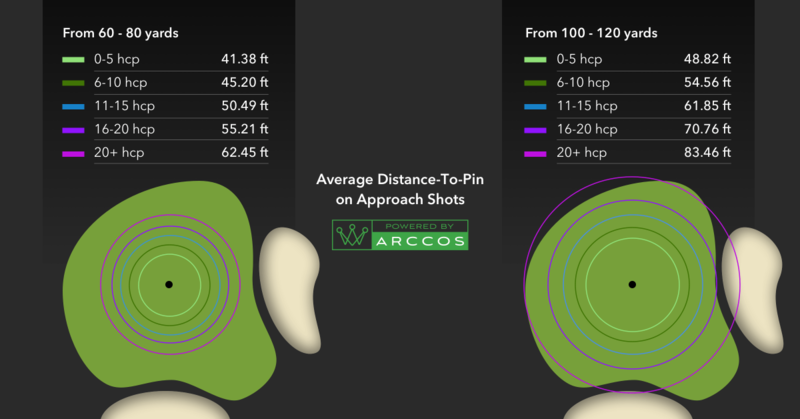 For a deeper dive, Arccos users can look at club performance for every wedge to learn which club has the best proximity to the hole. Then look at that club’s Smart Distance and voila, that’s your target layup zone. Tour pros make carefully calculated decisions for every shot on the course. Some of the most informative PGA Tour coverage involves a player and his caddie hashing out what club to hit off the tee, how to construct a recovery shot or whether or not to go for the green. Often that process involves working backward from the green. With Arccos, amateurs can do the same. Find a wedge that you can hit 95% of the time to the same spot. Practice to get it up to about 97-98% and that is your new layup distance. Exactly. I want a full swing @ 100 yds if I can’t layup inside 20. Those are the 2 shots I am most comfortable and consistent with, probably because there’s never been a 25-80 yd practice green available for me. Most golfers have distance dismorfia, they hit the ball further than they actually do – it stands to reason that golfers are always closer to the pin than they actually are!! Arccos only states what happens. To question the data it means you have you do not like reality. Does no one ever duff a shot. What happens when there are strong winds combined with biting cold and a tight lie? I know we still hit the perfect shot!! Dustin Johnston became a world standard player when his shots from within a 100 yards improved. How did he do that practice and practice. ….. Most of us hackers don’t practice but that don’t make it right. We should and if we did then our handicaps would or should fall. To stick our heads in the sand and ignore what is happening is why our handicaps don’t get better. Arccos will or should highlight the areas of weakness where we need to practice. Most of us need a reality check!! Interesting that everyone just wants to argue against data while all they have is anecdotal or personal experience. Arccos has each player’s handicaps, and actual shot tracking that is better than what most players can do manually. Seriously if you were manually doing all this tracking on course it would be pretty slow and cumbersome. People seem to think scratch players are as good as pro’s with their approach shots. If you just watch on youtube, even the touring pro’s are way better than teaching pros. And the teaching pro’s basically can play to scratch with little practice. And you think scratch guys can land shots consistently close to the flag like a touring pro can? Don’t get me wrong, scratch players are awesome but there’s a reason why they are not even mini tour guys. Jack, Mark Brodie’s Golfmetric app (developer of Strokes Gained methodology) claims from 100-150 yards the average proximity to the pin for a scratch golfer is 29 feet. It’s widely recognized data, Jack, nothing personal or anecdotal about it. Tracking my own game, as a 7 index, from 100-150 I’m 38 feet from the pin. How Arcoss (and now you) got these numbers so wrong is puzzling. Interesting you chose to argue for Arccos. More interesting is that Arcoss and MGS are silent on all these concerns regarding accuracy. Is Broadie off base? Is there a difference with interpretation? So if Arcoss is standing by these numbers, and MGS is going to pump the product, shouldn’t we the consumers speak up? How is Arcoss going to help my game when they seemingly can’t do basic arithmetic? And nobody here is claiming scratch golfers are as good as pros, Jack–where did you pull that from? Correct me if i am wrong but the goal of the analysis was to show if a golfer should avoid certain yardages or aim for others. If these peaks and drops in performance existed, an average across all golfers like the one in the article would not show them since they are likely to be marginal and SPECIFIC TO EACH golfer. Thus maybe a better analysis would be to check across the shots of each golfer of a time if these weak yardages exist for this particular golfer; if they exist try to guess what causes them (maybe awkward half wedge yargade, mabe shot swung too hard with lobwedge instead of clubbing up…). If the percentage of golfers that experiences these weak yardages is significant then encourage each golfer to try and find his own strong yardages instead of giving broad advice that was likely since the beginning to show that the closer the more precise golfers are :). I agree that the numbers for low hcp players seem high. I have been tracking this for years from stats on the PGA Tour web site. The median % error for fairway shots from 100-125 and 125-150 yards has been remarkably consistent in the 5.6-5.9% range. (my mechanics – take the miss distance from the middle of the pack for a given distance range, convert to yards and divide by average of the shot distance range. Be sure that you use a full year data; the current default is 2019.) The 2018 errors are 19′ 9″ and 24′ 3″ respectively giving for both an error of 5.8%. The % get worse slowly above 150 yards and quickly below 100. The takeaway from this is that if you hit a shot around 6% error, it is pro quality. Instead of debating this article’s distances. A relevant approach would be your distances on full, half or quarter wedges to the green. This will determine the club selection for a lay up or miss hit. This advice assumes a lot of practice. For somebody who doesn’t practice much, but has a very consistent swing, full hots are much easier to gauge than half shots. They are likely to be closer to the hole and easier to hit straight at the pin without significant errors. It is too easy to hit a half shot the wring distance especially if you play a lot of different courses. It is also easier to open or close the face in error on a half shot than on a full shot. You’d think that, but it ends up not being true in reality. Golfers hit shots from 50 yards, for example, closer than they do from 90 yards, even if 90 yards is their full swing and 50 is a yardage they almost never practice. There are exceptions, no doubt, but generally speaking, you hit it closer from closer yardages. Exceptions are rare. Well, it’s also obvious that people should be practicing wedge shots from not full shots. At least have a half and 3/4 swing with your wedges and know those distances. A 0-5 handicap misses by 16 yards, on average, from 100 yards. Not buying it. The corollary to that means they average 2.3 putts from 50 feet. It also means that for every shot within 5 feet there is a miss of 90 feet…from 100 yards? That makes no sense to me. Nice article, using data from Arccos, but the averages presented I view as horse hockey, especially the 2 lowest handicap brackets from both distances 60, 100yds (13 & 16yds) away. Have played golf for many years as a low handicaper, in a number of local handicap events, leagues & whatever, have hit/witnessed much better wedge/9I play, even from the higher handicap players from those distances.Of course from time to time, a shot will be missed, but playing full, half & open face wedges, you should be very consistent the majority of time, even hitting some stiff. Go out and play the game & hit various shots, types of shots, different distances, get a feel for your clubs; standing at the range pounding balls is not going to do it. If you have played the game for a while and you can’t do better than those reported figures & I’m sure they can provide their reasoning, perhaps it’s time to take up bowling, etc. No, they shouldn’t, because what Lowest Score Wins calls the “O-Value” or the number of opportunities per round to hit this shot is pretty small, and the C-Value (ceiling) isn’t all that high. In other words, suppose a player can go from a 35′ average to a 25′ average. That 10′ difference is going to account for less than a tenth of a shot saved, and the golfer is only going to have that shot a few times per round. Thus, the time spent practicing that wedge shot is going to save less than half a shot per round. Practice the higher “Separation Value®” skills more often. Agree. The course I play is tight with trouble on both sides so practicing accuracy with driver, hybrid, long irons will decrease my overall score significantly more than hitting it 10′ closer with my SW or LW. Not to mention practicing my putting from within 6ft where a lot of my par saves come from. Excellent article. I play about 15 tournaments a season and my best scores are when I putt well and my approach shots are within reasonable birdie range. Of course playing on about 10 different courses each season brings in so many variables. I play to a 6.8 and my rounds are framed by the number of three putts and doubles. On long par 4’s I live and die by my ability to pitch the ball within range to realistically make a par. All my wedges are custom fit so I’m confident from anywhere from 100 yards in. My goal is to make par. I would say that my short game is better than my handicap but my tee to green is higher than my handicap. I’m a ham and egged. I play to a 12 handicap. My GOAL from 100 yards and in is that my miss is no more than 10% of the total distance. The “half wedge” discussion doesn’t seem to apply for me since I carry wedges that allow me full swings from 60, 80 and 100 yards. If my misses from 60 yards were near 50 feet (28%) the wedges would be wrapped around a tree somewhere. I practice wedge play often. At least half the balls at the range are wedges. Steve, I suggest you stop wasting so much of your time hitting wedges. You should be spending a good chunk of your wedge time on driving and approach shots. For me it’s simple, get as close as I possibly can without putting trouble into play. 30yds is virtually always better than 40yds which is always better than 50, and so on. “Laying up to my favorite full wedge” is stupid if I can cut that distance in half and not risk a penalty. Then again, I probably hit as many partial wedge shots on the range as I do all full shots combined. Wow, I am a 10 handicapper and usually track down my proximity to the pin with approach shots from 100 yards in and I am sure it is not 40 feet. Not saying this is wrong data but I am just surprised. Maybe because I usually play greens that are relatively small? I’d guess someone took the proximity +/- of the hole and added them together. If you cut all those averages in half they seem appropriate. In reality, the difference between scratch and pro golfers from 100-125 yards is only 3 or 4 feet, not 22 yards. When I am 180+ out, I try to lay up to 80-85 yards. This is a perfect PW for me. If I am off on my distance, I am comfortable with a 9-iron from 90-95 or a Gap Wedge from 65-75. You wouldn’t rather try to hit the green from 180 and then have a short chip if you miss? He’s hitting a PW 80 yards. That means he can’t reach a green from 180 and taking it a step further, he probably can’t hit a ball that far to begin with unless it’s on a tee with a driver. Rather than hit a shot at his absolutely limit of around 150-160 yards with a lower probability of success, he’s using two reliable shots to keep the odds in his favour. No way these numbers are accurate. On many course a 48 ft. distance to the pin would be missing the green entirely. With a SW from 100 yards. For a 0-5 hdcp. No way I’m buying that. I don’t play with one single digit handicap player that averages 48 ft. with a wedge in their hand. It’s an average. No mulligans on bad shots. Missing a target by 16 yards on a 100 yard shot ON AVERAGE is bonkers to me. If I’m 16 yards away after a partial wedge I’m going to be upset and since it’s an average that means 0-5’s are often missing by more (maybe 20+ yards but that seems borderline impossible to comprehend with a wedge for such good players). I simply can’t wrap my head around scoring well if you can’t hit a green with a wedge. I agree Jess — the data sounds wonky to me. I don’t know any 5 handicap guys that don’t regularly hit the green from 100 yards out. For that average to hold water, they’d have to miss badly as often as they hit the green. Love this article. The numbers aren’t carved in stone as course conditons such as height of rough, dampness of grass, and/or wind factors may cause variances, but let’s just say the theory is more than sound. One reason alone is the mastering of The Half Wedge. I know that—“generally speaking”– from 65-75 yards out, my old timer’s swing likes a half a Gap Wedge, and from 80-90 yards a held off Pitching Wedge will do the trick. I had to learn this the hard way through experience, as we did not have this technology back in the day. I usually hit these within 30 feet of the pin. From 45-55 Yards is a “soft” Half-Sandy, while 35-45 is a Half a Lob. These will usually get me within 20 feet of the pin. Again—these are shots that take practice and have variances, but the basic overall theory is sound. I even have some shots measured off in feet vs. yards, for when I’m playing courses with smaller greens. Hate to state the obvious all the time but few hit it closer from further than vice versa. Hmmm almost poetic. But aside from anecdotal stats most good golfers realize they “first” need to look at the pin location and “where” is the ideal putting target location. That is, if you lay up leaving a pitch over a trap to a pin 10’ from the fringe with the green sloping away that’s not ideal. On Sunday deChambeau got in trouble off a tee and had no shot left so hit his approach to the left of the green leaving an easier up and down than hitting to the front of the green. The issue is akin to 9-ball in pool where a skilled player will leave himself well positioned short shots that are less complicated than double bankers that leave an even harder next shot. Golfers who play lots of new courses often lament after playing a hole for the first time “I won’t play this hole from that side of the fairway next time” because they didn’t realize almost every hole is designed to be easier if you know the ideal place to hit from. So your article is interesting but perhaps the follow up one should be how to think your way around a golf course. I was in a bit of disbelief at first like many. But these are averages. And single digit handicap’s flat out lag putt better. Hence the single digit. That said how many times are you watching the pro’s on TV and are stunned at how often they miss by 25’+ on an 80 yard shot? “I can do better than that” you say! After digesting it for a bit I have to concur. Mid handicaps miss far too many opportunities in the 60-80 yard range. Then there’s the errant shots going for it when they should have laid up. I see it all the time in my games. Ten more yards off the tee gets the most noise but this is where scoring happens. My personal bests have always come when I’m avoiding penalties off the tee and my mid/full wedges are dialed in. Go to any range and you see the higher handicaps banging away their bucket with the big dog. Look for the better swings and most of their time is spent with scoring irons and wedges. If mid/higher handicaps played most holes for an up and down they’d eliminate a lot of their double bogey+ holes. That includes long par par 3’s. Toss a 9 iron out there then grab a wedge and pin seek. Avoid the dreaded 5-6 on a par 3. The 100+ scores are suddenly sniffing breaking 90. Really good post here, with some very solid points. This par 3 advice would only hold true if penalties were severe around the green meaning water and/or deep, deep rough and/or treacherous terrain. According to the data, that mid handicapper hitting from 60-80 yards after that 9 iron is still going to be 50-55 feet away which, for most, will translate to an average 3 putt for a 5 and that’s only if that 55 foot miss doesn’t put them into a trap or leave a tough chip from some rough or a poor lie. I have never been a great ball striker so I have worked hard on my short game. I would rather have a partial 60° than a full shot any day. Playing to your strengths is always a good idea. I try to get to 90 with my new setup, it used to be 100 B4 I changed clubs. Wow. I’m a single digit handicap. If I’m 40 feet from the pin after a 60 – 80 yard approach shot, I’m pissed. I’d really expect to be no more than 20 feet from 100 yards which is my preferred lay up distance. Folks need to put down their Big Dogs and hit more wedges on the range. Wow so you expect to be better than the average Tour pro from 100 yards? Big expectations! I carry a plus handicap, but because I have realistic expectations I know hitting it inside 20 feet all that often from 100 yards is not going to happen. Unrealistic expectations with the short game have fueled the myth of the short game’s importance for decades. Stop giving bad advice, practicing short wedges instead of full swings will be detrimental to your golf game in the long run. Long game is more important than short game, get informed, don’t be sheep. No Dan, Ping doesn’t expect to be better than tour average. His expectation is very much in line with his handicap. On a 60- 80 yd approach, (that’s the frame of reference in his post, maybe you should look again) where do you think he should expect to end up, on average? I think +/- 9.5% variance is FAR from “big expectations”, and is NOT better than tour average. 40 ft average for 0=5 HDCP? That seems high, since that indicates that good players are up to 80 ft off line, distance as often as they are inside of 10 ft, dont buy it. But I have golfpad GPS and it does much of what Arccos does, and the flaw in the data is, are the players accurately marking the hole location. I dont do it, I dont even take my phone on the green to mark my location, takes too much time. So if this is not being done, too many shots would have a large error. But the premise stands, the closer you get, the easier it is to keep the shot online, then your error becomes distance, and that you can practice. This is a great point. 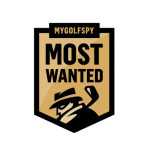 I use game golf for my own data and I’m fastidious about getting the pin position right but I don’t believe everyone else is quite so committed. Is it legal to play Arccos in an event or a club or tour tournament because it basically acts like a very well informed caddy…….. ??? Even so would love to have my clubs ‘connected’ even if it was practice rounds, i can’t think of a better way of learning your distances – even better than shotscope etc because this would be giving you that data while you are on the course and playing a round…… makes sense. Nice, your actualy proving mark broadies, every shot counts, strokes gained methodologie with a whole net dataset. I enjoy these articles. What the analysis is lacking in these 1 sided approaches is the approach shot strokes gained using a 3 wood from the deck to get to 40 yards away vs a hybrid to get to 90 yards away, what is the difference in that? I would bet the hybrid is far more reliable and would probably compensate for the difference in efficiency from 40 to 90 yards away. The 2nd aspect that is missing is also the 20 to 40 and 40 to 60 yards and 80 to 100 yards away, how much closer makes a difference, and is it worth it. I find the 40 yard shot difficult, but don’t mind the 75 yard shot. Why on earth would I lay up to potentially end up 40 yards away because this analysis says hit it as far as possible. This is where a 3 wood approach shot has a wider range of distance where the hybrid is fairly reliable. I have read the Broadie book and there are great nuggets, but I still believe there are some flaws in the analytics. The issue is, given the data, that all amateur golfers need to work on their 100 yard wedges/approach shots more – or whatever that full PW/GW/AW shot is that is in their bag. It’s easy to sit back and say, work on that half wedge, but that’s not going to be a reality for the average player. Any time you have a touch shot, you’re going to have outside vairables that screw things up. I discovered this last year when I went to a 50° wedge for all my approach shots inside 120 yards. Sure a full swing went X, a half swing went Y and I mapped out all those distances, but getting from 52 to 87 wasn’t an exact science. What did help, was determining where I wanted to hit in from, then leaving myself the needed yardage, plus or minus 5. What this did was give me a full, comfortable swing with a club that was dialed in. It was also about the time I started to understand what a useless stat GIRs were. For that exact reason you stated above, hitting a green and having 60 feet in isn’t going to help my game at all, where as missing one by 2 yards that leaves me 20 feet to the flag will. A 25 foot chip is much easier to get up and down than a 60 foot putt is. Ok, so to wrap up… My own conclusion on this exact subject was this: Find a wedge that you can hit 95% of the time to the same spot. Practice to get it up to about 97-98% and that is your new layup distance. Asking a weekend warrior to dial in their short game just isn’t feasible for most, but getting one full shot mastered sure can be. The point was it is easier the closer you get, but yes you should still attempt to get to a good yardage. For example if a comfortable SW is 85 yards, dont lay up to 100 because that is what everyone says, also it depends upon your course, if you can reach the par 5’s laying up to 60 makes no sense, but if you cant reach them laying up to 40 is probably just as foolish unless you practice the Pelz system and know your partial swings. But in the end side to side dispersion is less the closer you get no matter what. ^This. Exactly. There are sooooooo many things that can go wrong and change the distance on a “touch” wedge. I found my distance (+/- about 4 yards) for 2 simple variations for my PW – normal & low punch. Working backwards from the green, decide which shot I need to hit, then lay-up to that distance. It’s also easy to make day-to-day adjustments for weather and how my back feels by simply hitting about 8-10 balls on the range. My 3-putts have gone down nearly 70% and my recovery pars have increased by about 50%. Sure, if you have the time to dial in a touch wedge distance, great! If not, try this approach. As a high handicapper I fully agree with this approach. Often, people are simply wrong about their accuracy or abilities from yardages. They almost all average closer from 40 yards than they do from 80, but if they hit it to 15′ from 40 yards they’re pissed, when that is really a lot better than they hit it from 80. Heck, in one-club scrambles, we find that people hit it closer with (for example) a 5-iron from 120 than they do from their normal 200 yard yardage, despite _never_ having practiced that shot. Bought a Cobra driver with the Arccos sensor but my phone would not pair. Called Arccos. Apparently phones must have a gyroscope & one other feature to work with Arccos. My phone had one of the two. Maybe my next phone will work. I’d love to have Arccos sensor’s on each club. You need an accelerometer and gyroscope together with an android system 6 or higher. No idea about Apple. If only we could all hit the ball consistently. Then golf would be easy and we would all get bored. Accelerometer! That’s what’s missing! Thanks!